No football teams in the country have tougher schedules than those in the SEC. Never has that been more evident than this season for the Arkansas Razorbacks, who have Auburn, Texas A&M, Georgia, Alabama, Mississippi State, LSU and Ole Miss on the docket. But that’s why you watch every single week, to see your team take on the heavy hitters. 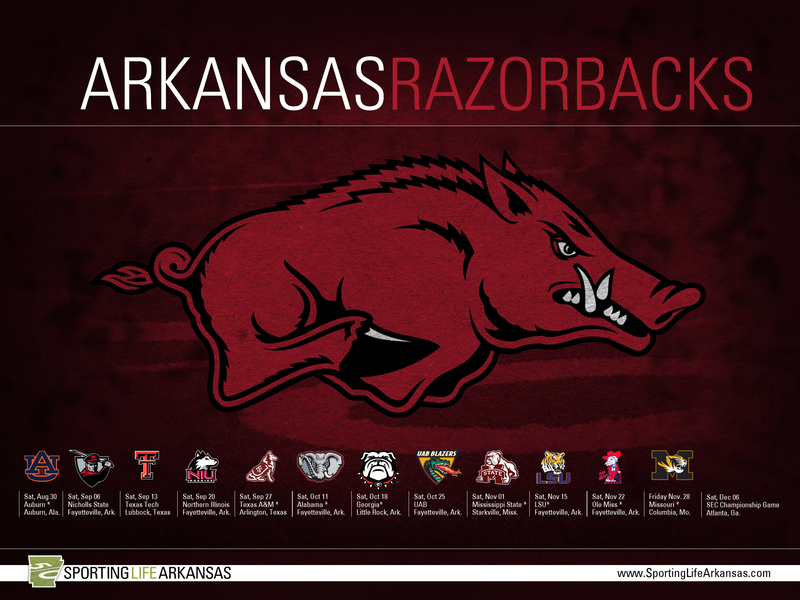 And it’s why you’ll want to download these great Arkansas wallpapers, browser themes and more. After all, when the going gets tough, the tough simply get going. There is no better way to stay connected with your Razorbacks than with the school’s official browser theme (available for all major browsers). You’ll get instant access to the school’s social media channels, along with the latest news and shopping channels to help you get the freshest gear. Of course, as a Razorbacks fan, you want to properly display your pride wherever you are. What better way to do that than with some Arkansas wallpaper for your computer background? Whether you’re at work or on your laptop around campus, these Razoback backgrounds will help you make sure you’re always pumped for the next big game. There’s nothing more important than school pride. You can’t leave your phone in the dust, though. While you’re loading up on Razorback wallpaper for your desktop, be sure to find your favorite Arkansas backgrounds for your phone as well. What’s more important than following your team? Answer: nothing. And thanks to the stellar writing you find at these Arkansas blogs, you’ll never be without a wealth of information to read about your favorite teams. Got another blog in mind that we didn’t include here? Let us know! Arkansas Fight – You’ll get all sorts of news and analysis about all of the sports teams at the University of Arkansas, including plenty of much-needed humor. RazorBloggers.net – Built on the contributions of a group of writers, this site provides plenty of news, including news about recruits. This blog has a great blogroll, too. Razorbackers.com – This blog contains a ton of its own Arkansas writing while bringing in other work from around the FanSided network. Hog Blog – Recaps, analysis, news and more about all Arkansas sports, along with humor articles and in-depth features about the school and its athletic history. 2015 football schedule shows 2014?